Wakeboarding in Davao offers possibly the most exhilarating water sports opportunity in the Philippines. 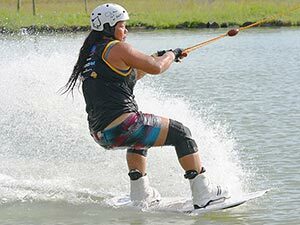 The Davao cable wakeboard park is custom built to deliver thrills and spills above the water, and has the most modern equipment and facilities to ensure maximum fun. 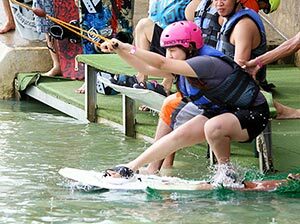 It matters not whether you have ever been wakeboarding before because at the Davao cable wakeboard park full instruction is provided as well as all of the wakeboarding equipment you will need . . . if you can imagine wakeboarding action Travel Davao can deliver. Half–an–hour West of Davao City is the Deca Wakeboarding Park, set in its own grounds and complete with custom–built, diamond shaped lake, restaurant and viewing areas. The Deca Wakeboarding Park is one of the newest and largest in Asia and is starting to become famous amongst wakeboarding enthusiasts from Singapore, Malaysia and Hong Kong because Davao is easy to fly to and Travel Davao wakeboarding packages make getting here as easy as falling off a wakeboard. Travel Davao will arrange the transportation and all of the equipment you will need for your wakeboarding adventure, all you will need to bring are clothes that you don't mind getting wet. The wakeboarding day starts just after sunrise and carries on until the last rays of the setting sun have turned the clouds a brilliant selection of reds and pinks. If you are a beginner you will take one or two launches and rounds of the lake on a kneeboard, to familiarize yourself with the pull of the cable and control of the board; by three launches you should be ready to stand and deliver a breathtaking fast-lap and spray a few spectators. If you are a novice or experienced wakeboarder then there are instructors on hand so you can leap into action immediately or to give tips on advanced maneuvers. Three rounds is usually enough following each launch, to give you time for relaxation and to take some photographs of others practicing their art. Within a day the average launches is 15-20 depending only on your stamina and the numbers of people in the queue. Davao wakeboarding tour packages take at least half–a–day but most people stay all day. If you choose to go wakeboarding for more than one day, transport will bring you to the cable wakeboard park every morning from your chosen hotel or resort and will return you via a different restaurant every evening. Davao wakeboarding tour packages include: airport pick–up; transport from Davao City, to and from the cable wakeboard park; rental of wakeboarding equipment, such as personal floatation device, wakeboard and helmet; hiring experienced wakeboarding instructors; and, food & plenty of water. Accommodation is also provided at the hotel / lodging of your choice. Davao wakeboarding is a moderately strenuous activity so you may not want too many add–ons, but if your group decides to finish wakeboarding after lunch then attractions nearby include Davao’s famous Waling–Waling orchid gardens and the Philippine Eagle Sanctuary - both well worth the visit to unwind the soul after a thrilling day of wakeboarding.